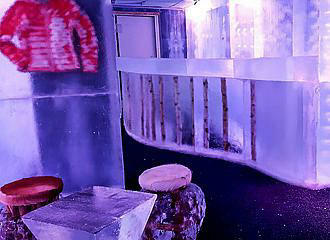 Located within the Kube Hotel, this is a unique and one of its kind experience in Paris, where you can enjoy Vodka cocktails at a bar purely made of ice in a chic atmosphere well below zero where you are provided coats and gloves for the time you are there. The Ice Kube Bar was a completely innovative and unique concept to arrive in Paris that first opened its doors in 2007, having been designed by the renowned ice sculptor Michel Amann, utilising over 20 tons of ice to create a below zero experience. 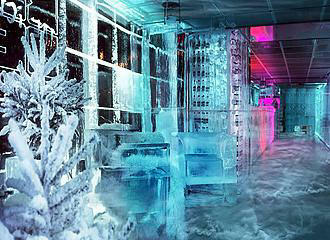 This unusual ice bar changes its appearance every winter season, with the bar itself along with seating all made out of ice, so even if you decide to go back to the bar on a different occasion, you will see a changed design. Now this is a very small bar that can only accommodate around 20 people at a time, which is set to a temperature of 18 degrees below zero, so when you arrive you are provided with a parka style winter coat and gloves to help you keep a little warmer. There is an entrance fee of around €40 but with this you are served approximately 4 different types of Grey Goose Vodka drinks, although there is also a time limit to your experience of a maximum of 30 minutes, but after this length of time you will probably be ready to leave and enjoy the restaurant with DJ downstairs or go back to your hotel and warm up. 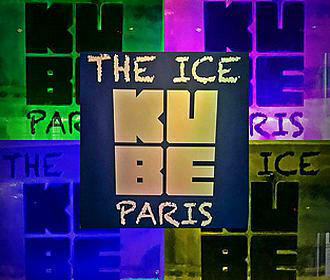 Located within the 18th Arrondissement of Paris the Ice Kube Bar can be found within the Kube Hotel on the mezzanine level upstairs and with an entrance fee of approximately €40 you are able to enjoy this unique experience for a maximum of 30 minutes. Booking is required due to the small capacity and popularity, plus there is a dress code of smart dress, meaning no jeans or trainers are allowed, and if you do turn up in this kind of outfit, you will be refused entry. You will find that a Monday and Tuesday are reserved for private functions that have to be booked well in advance, however the Ice Kube Bar is open to all, even if you are not staying at the hotel, which is on a Wednesday to Saturday from 7pm through to 2am, but a Monday and Tuesday are reserved for private prior arranged events. Now when it comes to getting to the Ice Kube Bar, it is tucked away in a quiet street and the nearest Metro station is the La Chapelle stop serving Line 2, however a little further walk in the opposite direction you have the Marx Formoy stop serving Line 12. Yet the bus numbers 36 and 65 along with the Noctilien Night Bus Service via Line N43 will also get you very close to this unusual ice bar, or again, a little further away you have the options of the bus lines 48, 60, 302 and 350.